Join us as we welcome one of ours and yours favorite show Traveling Kicks to the Radio Air Waves! We are excited to have them on every weekday Monday through Friday 2-3 pm! Make sure to catch The Socialite DJ and Traveling Kicks here with us The Fashion Radio! Traveling Kicks is our show about sneakers and the sneaker community. Not only do they talk about sneakers but The Socialite DJ as well gives tips on how to clean your sneakers, and restore, as well as giving you history and facts about the shoes and their brands. Traveling Kicks is not only entertaining but informative. 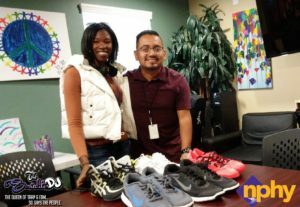 The Socialite DJ has been working hard for content, as well they are gathering donated shoes and cleaning and restoring them to a new condition. Once they’re (the sneakers) restored Traveling Kicks donates them to NPHY who helps homeless and at-risk teens. Stay tuned for Traveling Kicks every weekday 11am to 12pm Pacific time!